Today I am sharing with you how you how easy it is to create a DIY heart wreath, using up some fabric scraps plus odds and ends of wool to create the pompom heart. I struggle a little with the commercialisation of holidays/celebrations, shops full of gifts and cards to buy, to encourage us to part with money. We do not need to spend hard earned cash to tell someone we love them, or to make them feel cherished. Instead, we can use what we have, enjoy creating, having fun. 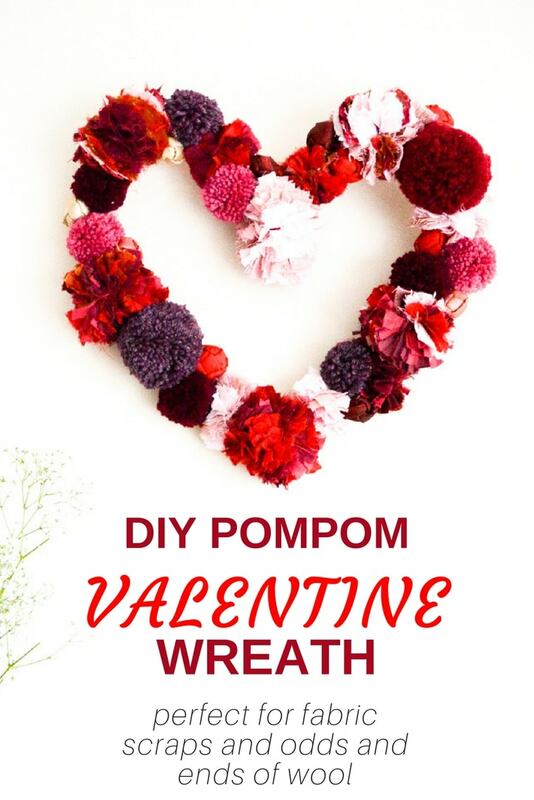 This DIY Valentine wreath is perfect for using what you have. The pinks and reds will brighten any wall or doorway up and bring a smile to people faces. Create a heart frame to attach your Pompoms to. Using thick cardboard cut out a heart shape, I have used a paper stencil to create two virtually equal sides of the heart. Wrap this with strips off toning fabric. Attach a hook to the back of the heart at the base of the V so you can hang the finished wreath. I have used a paper clip. Alternatively you can bend a metal coat hanger into a heart shape, create a second slightly smaller or larger metal heart. Wrap the two together with a strip of fabric to create a heart frame, keep in equa distance between the two shapes. Create a range of pompoms with different colour wools in various sizes. Wrap the wool around the pompom maker one side at a time. Close the pompom maker, cut around along the edge. Wrap wool round between the pompom maker sides, pull tight and tie a knot. Cut thin strips of fabric a centimetre or thinner. Usina a selection of fabric wrap around on to the pompom maker. Complete pompom as above. Using a glue gun or a fabric glue attach pompoms to frame. If you are looking for further minimal waste valentine ideas why not visit my Pinterest Valentines board, or check out my denim heart pencil cases – super cute, or a picture frame featuring maps of key places. "6 Quick & Free Crochet Hat Patterns"
This is really very cute! Think I’m gonna get a pom pom maker! A great upcycle, I love the mixture of wool and fabric pom-poms and the reds and pinks. I also like the fact that you made your own heart shaped base out of rubbish rather than buying one from a craft store. The wreath is gorgeous. This is gorgeous Vicky, I love the pom poms made from scrap fabric. I love this, I’m really loving wreaths at the moment. I’ve never tried a pompom maker before. Cute idea! I just want to find out the woolen I didn’t use up last year after finishing a scarf! Love your post!